Titled Pastetseo in “The Art of Good Cooking,” with only a brief introduction stating that the recipe may be Greek or Syrian, I wanted to know more about this multilayer lamb casserole with the strange name. I naturally turned to google but was surprised that nothing came up. Unable to resist the excessive layering of ground lamb, pasta, cheese, sauce, and eggplant, I moved forward with this recipe for Pastetseo and figured I would continue my research on it’s name and origin another time. It wasn’t until later, when I happened to be enjoying the delicious leftovers of this casserole that reminds me of a gourmet hamburger helper (but way better), that I came across an article about a Greek Easter feast in a magazine I was flipping through. A full page photo of a casserole and a recipe next to it titled “Pastitsio” caught my eye. The ingredients were almost the same, give or take few minor ones, and the eggplant was missing (one of best parts, in my opinion). Mystery solved. Googling “Pastitsio” brings up tons of photos, recipes, and info. 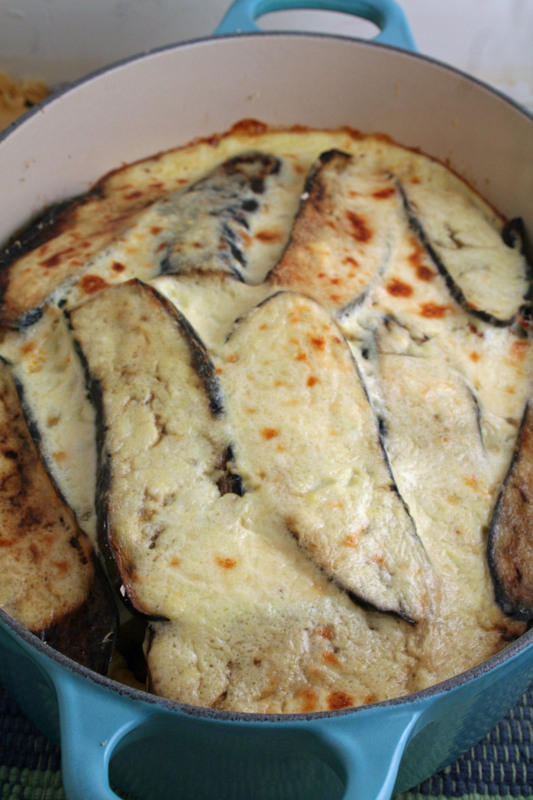 This moussaka like casserole appears to be Greek, but even with the correct spelling online, the exact origin seems debatable since Cyprus, Egypt, and Malta all seem to have similar versions. 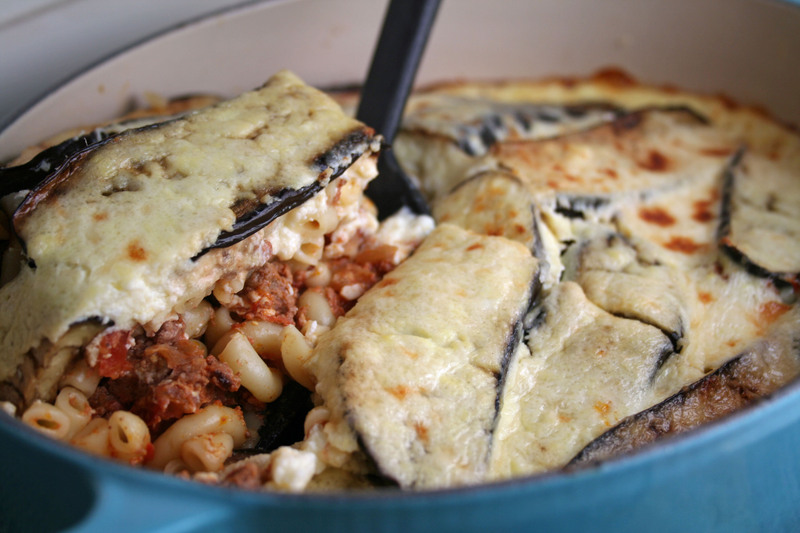 Since I still haven’t found any recipes online that include eggplant, I’m not sure where this addition came from but it definitely gives this Pastitsio another unique layer of flavor that in my opinion makes it better than any of the others out there. Enjoy. Saute onion and garlic in 2 tablespoons butter until soft. Add the lamb and cook for about 5 minutes. Add tomatoes. Break up meat and tomatoes with a spoon or fork and cook until mixture is almost dry. Season well with salt, pepper, nutmeg, and cinnamon. Add eggs and 1/3 of a cup of grated cheese. Combine the mixture with cooked, drained macaroni and pour into a deep well-greased baking dish. The dish should be about half full. 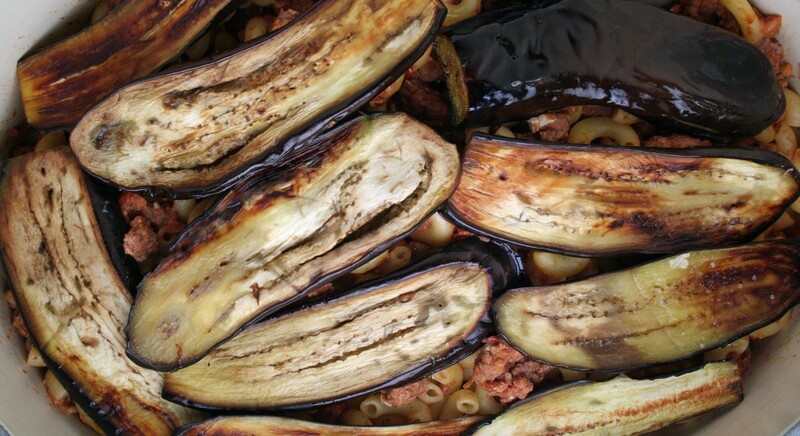 Place slices of sauteed eggplant over the meat-macaroni mixture. Pour the Cheese Custard (below) over all. Sprinkle with remaining cheese and an additional 2 tablespoons melted butter (optional). Bake for 45 minutes or until custard is set and browned. Serves 4-6. Melt butter in saucepan. Add cornstarch and cook over low heat, stirring constantly. Add hot milk and cook until slightly thickened. Pour some of the thickened hot sauce into the beaten eggs, beating constantly. Then pour egg mixture into the rest of the hot sauce, beating while you pour. Remove from flame and beat in ricotta cheese. Season lightly with salt and pepper.